The “Terrazas del Lago” project by César Frías Enciso and Miguel Pradillo of Morph Estudio, won the Best Completed Project award at the 11th PORCELANOSA Architecture and Interior Design Awards, whose panel was made up of prestigious professionals Luis Vidal, Rebecca Jones, Ricardo Mateu, Pierre-Yves Rochon and Rafael Robledo. Both Morph Estudio and developer Inmoglaciar have seen the project grow, in around 7 years expanding from a sketch to an iconic building in the province of Madrid. Next to the lake of Valdebebas and facing the Felipe VI park in Valdebebas (Madrid), this residential complex is found, made up of 83 residences of 1 to 5 bedrooms, having obtained the A energy rating, in which the materials of PORCELANOSA Group have helped to achieve this high qualification. 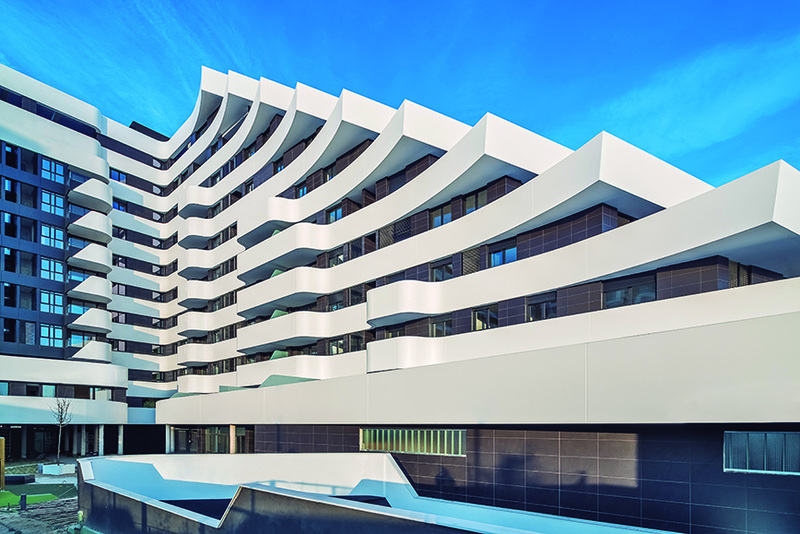 At first glance we find a curved facade with a uniform texture which breaks with the typical design of horizontal strips, the 5,200 square metres of KRION 1100 Snow White being the prominent material in the building. For this work, the K-FIX construction system (from the Group’s company Butech) was used for attaching KRION to this ventilated facade.